The mood in the squad was very high and Alex was doing everything he could to keep it that way. Gedoz had been in great form during the season and was leading the assist chart so Alex deciding to give him a small raise and get him contracted for an extra year to ensure they would keep him happy and if they had to sell him they would get as much money as possible. The team were preparing for the game with focus and determination and Alex was doing everything he could with his coaching staff to prepare the players for the game. However, all the confidence and planning couldn’t stop one thing. If Standard won then Brugge would still all but have the title but, they wouldn’t be confirmed which was what Alex wanted to ensure as soon as possible. With the teams being huge rivals it was rare that Alex wanted them to collect points but he, and a lot of other Brugge fans would like them to pick up a point. 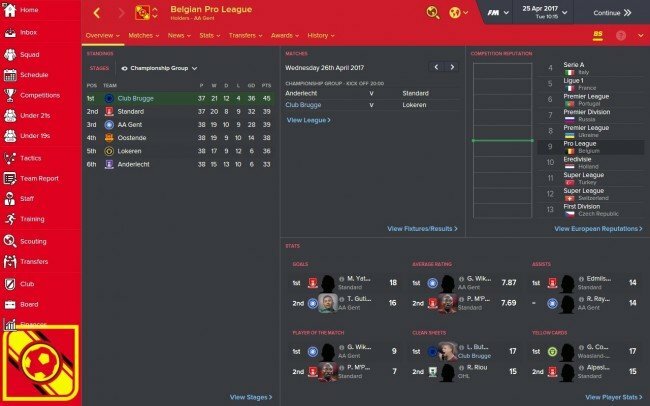 Anderlecht had nothing to play for except the pride of not finishing bottom in the Championship group, which for a team with the history and pride of Anderlecht finishing last was not something that would be happily accepted by the fans who were already disappointed by the last couple of seasons. Brugge and Standard were both favourites and with it being a huge game Alex was going for the strongest team he could even if the players were a tad fatigued as if they won he could give them time off. His back five picked itself for Alex as well as the DM spot. At CM he had his first dilemma which of the three of Vanaken, Martins and Santamaria. Alex decided to go for Martins in the more advanced role which he was best suited for and left him with Santamaria and Vanaken more the slightly deeper role. He decided to go for the extra experience Vanaken had for the big games and Alex also felt he partnered better with Martins and Fejsa as they played more together. With Luciano leading the line Alex just had to pick his two wingers. Gedoz got the right winger spot as he played it the best and Alex had to pick between Centurion and Izquierdo. The latter had started the season in top form and banging in goals however, his form had fallen off recently and Centurion had impressed since joining from Sao Paulo and he had been in some good assisting and goal scoring form recently which was enough to give him the nod form Alex in the starting line up. Alex had his first team squad assembled for the game and they were confident of winning the game and the league even if it would need a helpful result from the Anderlecht vs Standard game. 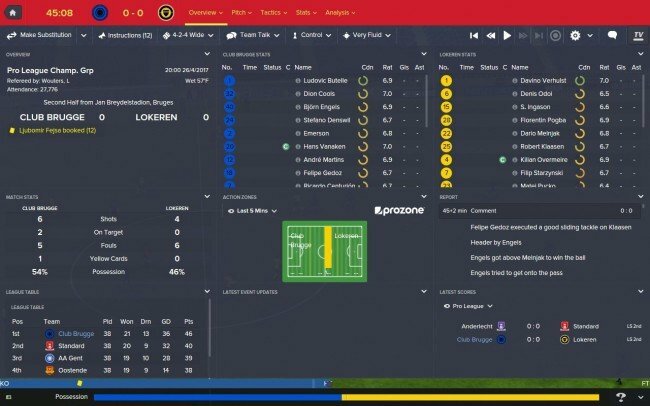 Lokeren named the ex-hot prospect Corentean Jean on loan up front and the brother of Paul Pogba at centre back in the usual 4-2-1-3 the team used. 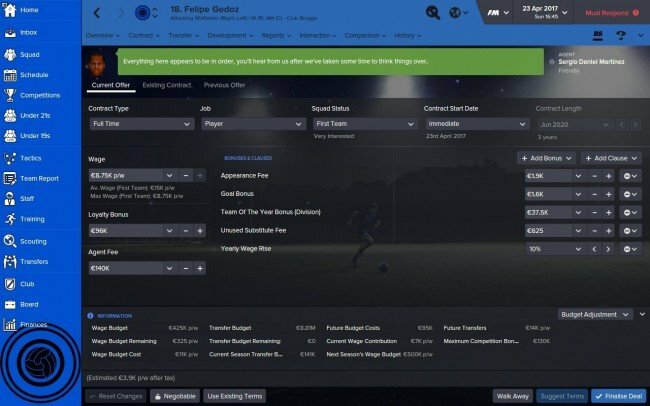 A bettering of the result Standard got would see Brugge win the league. The first half flew past with no good chances for either side. Centurion got in a good shooting position at the end of the half but, his shot flew miles wide of the target. 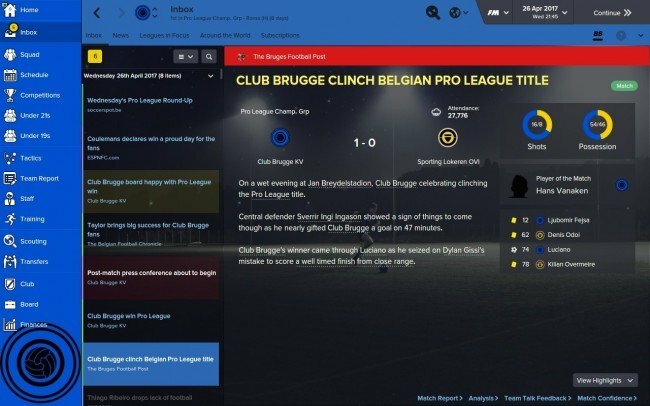 The silver lining was that Standard and Anderlecht were also drawing so Brugge still had a decent shot of winning the title if they could win the game. 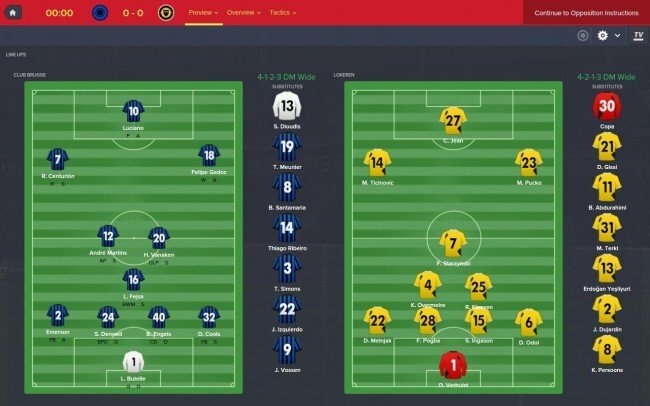 As the team had been playing defensively Alex made a couple of attacking changes and put on Thiago Ribeiro with Fejsa making way for him and a move to a 4-4-2. 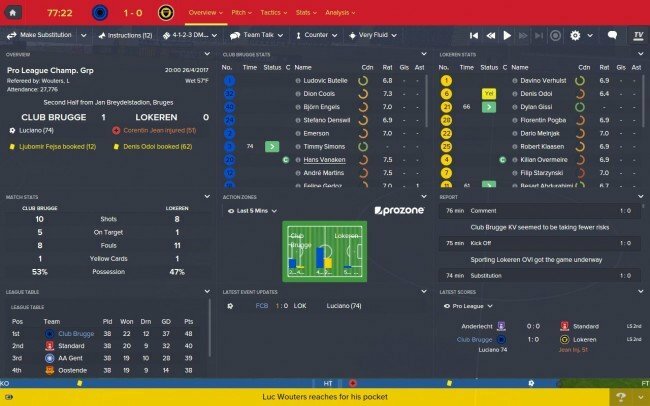 Two minutes after half time Lokeren had a throw in deep in their own half. Odoi threw the ball into Ingason who passed to Pogba in the box. He misplaced his pass however and it slipped in between Pogba and the keeper neither of whom could reach the ball. Ribeiro had anticipated this and as in space at the back post and hit the ball firmly low towards the corner. Alex was about to celebrate until the keeper reacted incredibly to push the ball behind for a corner somehow which was only just headed over the bar by Denswil. Soon after Jean went down holding his ankle for Lokeren and had to be carried off. Alex made his second change around the hour mark and put on Izquierdo for Centurion who had been largely ineffective. Both games headed into the final 15 deadlocked at 0-0. Brugge had a free kick just in their half and pushed almost everyone up. Engels played the ball wide to Cools who passed to Vanaken with his first touch. He played the ball up to Gedoz who had lots of space a wide of the box. He ran up a bit and whipped a cross into a crowded box. Luciano got free of his man and just after the ball bounced he stuck his leg out and from close range redirected the ball into the back of the net to give Brugge the lead. 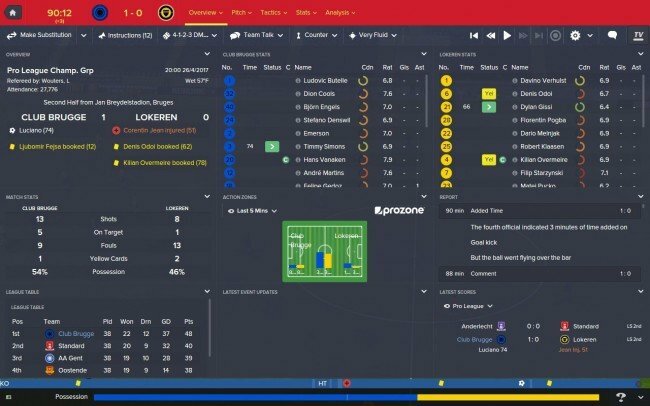 The game in Brussels was still a draw and Alex decided to try and kill the game off and put on Timmy Simons as a DM and took of goalscorer Luciano to a huge reception. The game wound down further and further with Alex keeping as much attention on the game in Brussels as the one in front of him. Both games went into injury time and Alex paced up and down the technical area as a coach listened to the game on his phone. Three minutes of injury time were signalled for in the match in front of him Engels took a free kick after killing as much time as he could. He played the ball wide to Gedoz who waited with the ball for pressure then passed inside to Simons. He passed with Martins and Vanaken to kill ten more seconds before the ball was played wide to Izquierdo. With one man in front of him Izquierdo chose to cut inside and got in front of the goal 30 yards out. He faked a shot to get past his man and no defender could get across to him quick enough. From a tight angle he blasted a shot away the was parried back to him. His cross was knocked out for a corner to loud cheers. Gedoz meandered over to the ball placed it took three steps back went forward again and moved the ball a bit and went back again. He then sent some signals to the two players in the box for where they should run and after killing over half a minute took the corner. It was to close to the keeper who claimed it but fell to the ground with the ball and another few seconds ticked past. He stood up and after looking around threw the ball in front of him. No one from Bugge was going to rush him and Alex watched the seconds tick away as the ball was launched high into the middle of the pitch. It went right to Engels who passed to Gedoz. He got past his man and made a bee line for the corner flag. He got to it but, was soon dispossessed by Pogba who cleared the ball as cheers suddenly started erupting around the stadium. Alex turned to look at Stan who was listening to the game celebrating and knew that the result in Brussels was a good one for them. “0-0” Philippe yelled happily. Alex turned his attention back to the match at hand and was about to relay the news when he realised the players could likely guess it. Pogba’s clearance was headed up to Vanaken who passed to Simons in lots of space. He passed to Martins as the game hit the final sixty seconds. He passed wide to Izquierdo who took a poor touch and the ball went out for a goal kick. Thanks to some less than enthusiastic ball boys and goalkeeper another twenty seconds had run off the clock when the ball was back in play. Alex felt a tap on his arm and turned to see it was the Lokeren manager. He shook Alex’s hand and congratulated them on the title a few seconds early so he could celebrate. Alex thanked him and shared handshakes with the staff at Lokeren. The goal kick was booted forwards and the ball pinged around in midfield until it went to Pogba. Who to Alex’s joy passed back to the keeper. He took some time on the ball before he hit it forward. Vanaken rose high and headed the ball up to Ribeiro. He lost out in the air but, the ball fell to Martins. He passed to Vanaken in space and he held onto the ball for a few seconds until he passed to Simons. Simons took a touch and then the referee looked at his watch put the whistle to his lips and blew three times. Alex knew what it meant along with every other Brugge fan. Club Brugge were the champions of Belgium. Alex joined everyone celebrating after winning the league. After some celebrations on the pitch the team headed back into the locker room so the pitch could be prepared for the trophy ceremony. Alex got soaked in Champagne within two steps and reacted quickly to avoid getting hit by the cork of another bottle. After a couple of minutes the team headed into the tunnel and back out into the drizzle to collect their medals. Alex was the last one got his first professional winners medal and then with Timmy Simons they were handed the odd Belgian league trophy. They raised it high into the sky as the decibel level in the stadium flew up yet again. Alex passed the trophy off to Timmy and headed over to his back room staff to celebrate with them. Cheers flew up every couple of seconds as the trophy was lifted by different players before the players headed over to the staff headed over to pose with the trophy and the players. The pictures were taken and Alex got soaked through with Champagne yet again. He passed the trophy over to Philippe and suddenly felt himself getting carried up into the air. Alex was thrown around by the players for what felt to him like an hour but, was probably less than a minute. After finding his phone and medal Alex saw that the players and staff family was coming onto the field and went to go find his family. He was able to grab the trophy and a number of press journalists were more than happy to take a family photo with the trophy in it. Alex handed the trophy off to Luciano and he got together with the rest of the South American attackers for a group photo Alex found Simons who was taken everything in. Alex exchanged some small talk before realising that Jake had wandered off somewhere during the conversation and Alex left to go find him. The team started a lap around the stadium with their families and the silverware lifting it to loud cheers. Engels got a loud cheer as he showed off some very impressive gymnastics, especially for a man who was 6'4. The team got back to the locker room after about an hour and Alex quieted everyone down and got the room's attention. "Training is cancelled for the next two days. Enjoy yourselves." It was met with some very loud cheers and everyone got changed into some more going out clothes. It was a very long party and the kids left at around 11 and the alcohol intake became a lot louder. Alex had planned to not get to drunk in front of his players however, he was given quite a few drinks by players and felt that it would be rude to refuse them so had them all. Alex later learned their was a bet on between the players on how drunk they could get him and Alex learned he won Vanaken a great deal of money by getting off his face drunk. He wasn't overly concerned as he downed a drink of something awful. While he was bad some players were taken great advantage of having some time off with Meunier and Denswil getting into a drinking contest that was slightly out of hand and stopped after they had decided to see who could down a bottle of vodka quicker. Butelle also had quite a lot to drink and it showed when the man who usually had such good hands failed to hold onto a beer. At about 3 in the morning Alex called it a night and got a taxi back home. He left a rather large tip and headed to bad. The next day Alex woke up with a rather sore head but, the league winners medal that he had on helped ease it as did seeing that none of his players did anything newsworthy when drunk. Alex got up and promptly sprinted for the toilet and some of the alcohol made the opposite journey to the one it had made the night before. With most staff given the day off Alex didn't have to get out of bed and go to work. He pleaded off going out to see some of his wife's friends with the excuse of food poisoning, although Alex had a hunch that somehow his excuse could been seen through as been hungover without a lot of effort. Sorry for not updating in a while but, would just like to say thanks to everyone who has viewed this and really pleased that my first story here has got over 20,000 views. You are reading "The retirement of Alex Taylor".